The Ph.D. program requires 33 course credits. This coursework can generally be completed within the first year. 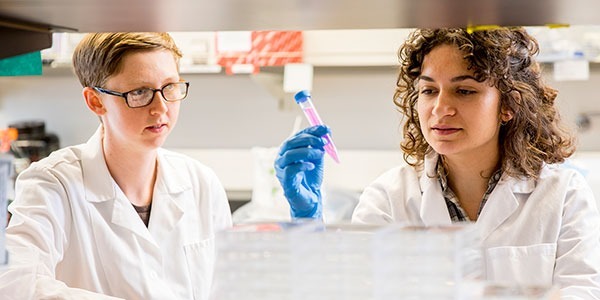 Ph.D. students in core BIOE faculty labs are funded for the first 2-3 quarters by the department and thereafter by the student’s PI as a Research Assistant (RA), assuming satisfactory progress toward the degree. PhD students in adjunct BIOE faculty labs are funded by the adjunct faculty member, including rotations. Continuing funding for students in good academic standing who choose adjunct faculty as the dissertation adviser is based on the current funding policy of the adjunct faculty member’s department. Ph.D. students receive a monthly salary, tuition coverage, and insurance benefits (medical/dental/vision). All students are responsible for minimal quarterly fees. I want to work in a certain lab/with a specific professor. How do I get a position in a lab and do I contact the professor directly? To get a position in a lab, you must first first be admitted. Although you are encouraged to learn more about our faculty and are welcome to contact them directly, please note that lab space will not be guaranteed unless you receive a formal offer from the Department’s Admissions Committee. Ph.D. applications are due December 4, 2018, 11:59 p.m. Pacific Time, USA for Autumn 2019 admission. Late or incomplete applications will not be accepted. Do I have to have a M.S. degree to apply to the Ph.D. program? No. The minimum degree requirement for our Ph.D. program is a bachelor’s degree. We do not have a minimum score requirement. The averages for our 2018 Ph.D. cohort were: GPA: 3.74 (on a 4.0 scale); GRE (percentiles) Quantitative: 88; Verbal: 86; and Analytical: 71. Please refer the instructions on how to submit an application on our PhD admissions page. UW starts sending out notifications (via email and/or through the online application profile) to students as early as January and all the way through early March. No. Students’ primary advisors must be core or adjunct faculty. Once you secure a primary advisor, it is possible for you to be co-advised by an affiliate faculty member. Any faculty are welcome to mentor our graduate students; however, only core or adjunct faculty may serve as a student’s advisor.